Probably all GPS receiver support the NMEA protocol (National Marine Electronics Association). This protocol dumps pure and readable ASCII characters to a serial link. Traditionally this was a RS232 connection with low speed. Such receivers (and more complex GPS devices supporting this mode) can just be connected to a RS232 port and be read via a /dev/ttyfile. If the PC has no or no more free RS232 port see USB serial how to connect a RS232 serial device to a USB laptop. This receiver contains a serial to USB converter chip inside plus a GPS receiver. When plugged in lsusb shows it is a Prolific chip. Build a kernel and select under device drivers > usb support > usb serial converter support for the chip. 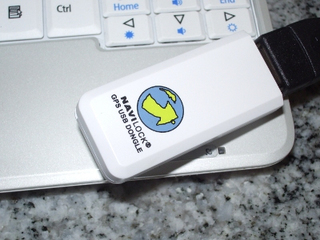 Having the kernel with the device driver, the Navilock gps receiver will be accessible via /dev/ttyUSB0. For a quick test type cat /dev/ttyUSB0 and you see some characters arriving in the console. Since the baud rate probably does not match, the output will not be readable. However this works probably just when working as root. Checking the file /dev/ttyUSB0 shows that it belongs to the uucp group where your regular user account is probably no member. Therefore include in your user account also the uucp group. Finally to see the nice NMEA strings, start gtkterm and set the baud rate of 38400. But then gtktem might refuse to open since it does not recognize /dev/gps0as a tty device. If an other tty device is available then gtkterm opens and /dev/gps0can be entered and then it works. For the HAiCOM CF or PCMCIA GPS receiver HI-302CF create a kernel with char devices serial devices 8250 PCMCIA support. Then e.g ttyS1 will be your 4800 NMEA port. Just one application can get the GPS data. No simultaneously use of the gps data is possible. The gpsd can be put between GPS receiver and applications to solve these issues. The gps daemon gpsd is available from http://www.catb.org/gpsd/and communicates through a TCP/IP port. cgps for a text console. 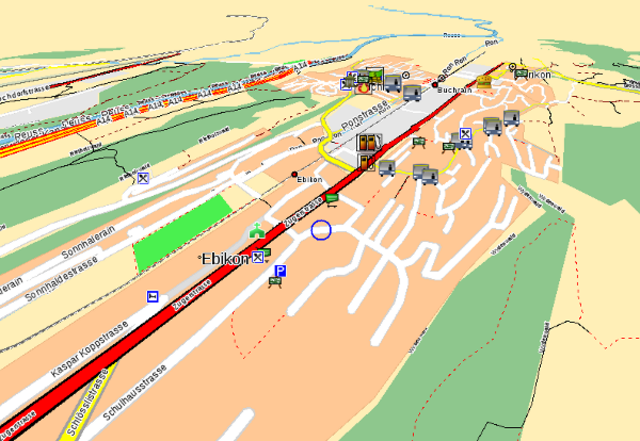 Gpsbabel supports many gps devices and formats to exchange data such as waypoints, tracks, routes. See: http://www.gpsbabel.org/. Unfortunately there are still some binary format as the ones from the older versions of http://www.swisstopo.admin.ch/that are not openly documented and therefor not supported. 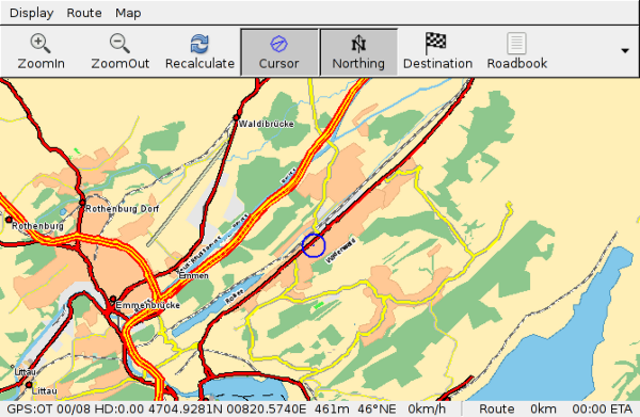 Gpsbabel supports gpx (the GPS Exchange Format) that is pure XML, see: http://www.topografix.com/gpx.asp. 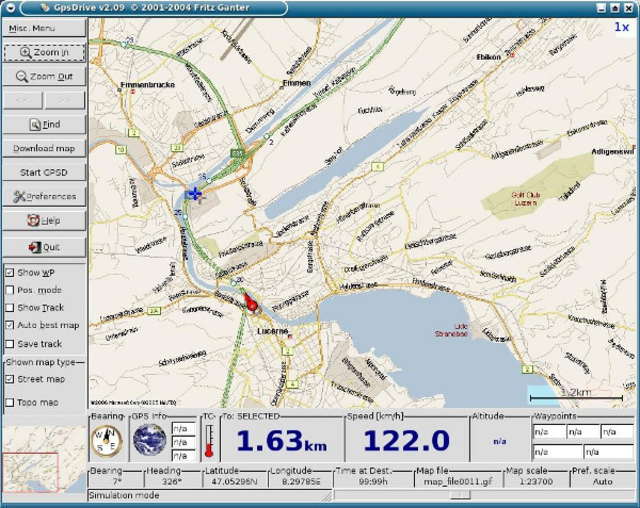 Since the gps manufacturers could not agree on a common data format gpx has become a standard that is widely supported. As example you can open gpx in google earth. Inside gpx files there can be different and multiple things, as a single track or all your tracks, different way points or routes. Since gpx is xml it can easily be edited using a xml editor. 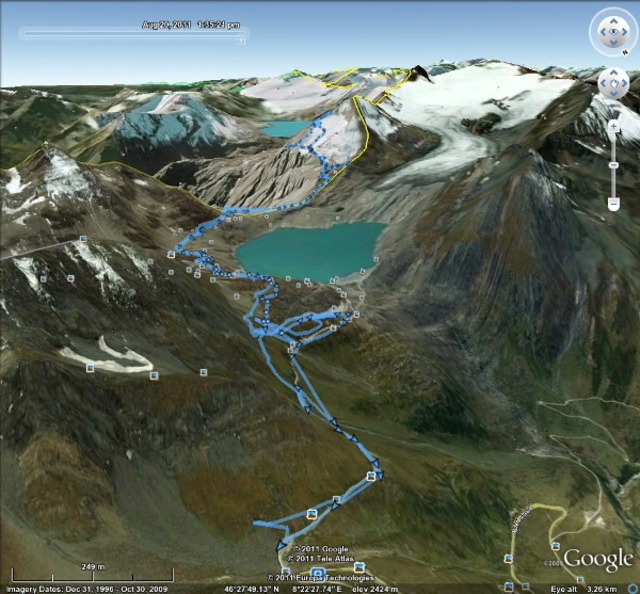 As example all except the desired track can be deleted and then imported to google earth to get a picture as above. Unfortunately gps gets sometimes in trouble not finding enough and good gps signals especially in steep mountain area facing south (from Switzerland's point of view). Obviously it is wise to use gpx as format for the files stored on the computer. A Gui front end for gpsbabel type gpsbabelfe to get the gui that comes with gpsbabel. Using the gui the command line parameters must not be identified. This way nmea gps data can easily converted to gpx. The program is still in a early stage but works well. Gentoo makes use use of an ebuild with a 9999 number and fetches the sources directly from cvs ( emerge navit) therefore no released version will be emerged and the manifest file does not have a DIST entry with the checksum to be verified when the source code is received. 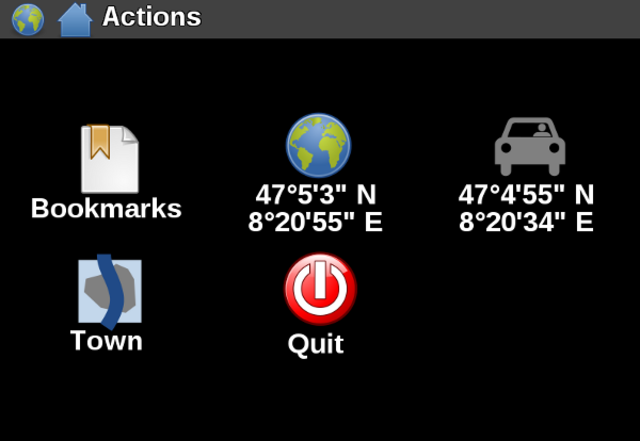 However on the navit site there are released versions available.The useflags to be consider are gps and speechd. It can make use of speech output using speechd. After emerging do cp /usr/share/navit/navit.xml ~/.navit to get the necessary config file. The defaults are ok when using gpsd. The navit.xml file is a regular xml file that can be edited with any text editor or with a xml editor. To switch between different options and enable/disable features the xml tags used have often the attribute enabled that can be set to yes or no. This is easier than to comment and uncomment sections. There are two GUI's available: The Gtk and the Internal. The Internal Gui aims more a navigation device with 3D views and simple big user interface. The Gtk is more as a regular PC application. Obviously the settings for the desired map of your neighborhood has to be made. Check that the xml attribute enabled is set to yes for the preferred gui. The easiest way to get a map is going to http://maps.navit-project.organd grab the map out of a world map, it makes use of http://www.openstreetmap.org/ a converted binary file is fetched ready to be used by navit. With osd take care that buttons are not at the same place as labels, otherwise buttons might not work. When happy probably do a bash script and a desktop launcher for that. Day or night layout is changed automatically depending on time. The order of layout tags is used to set the default layout. Don't define a night layout to disable it. Make sure under settings > map you have selected route, so you will see the route. Select the destination in action > town or action > bookmark. If nothing happens select a close destination and see if it is a map issue. It is not stable under gentoo and runs really slow on smaller devices. Also many changes happened among their versions and the user interface is not intuitive.